The ADV-4100EC is a single channel HD/SD MPEG4 / H.264 encoder. It supports a wide range of digital and analog video and audio inputs. These are: CVBS, HD/SD-SDI, HDMI, YPbPr and stereo audio. The H.264 Encoder can support high definition encoding of up to 1080P. 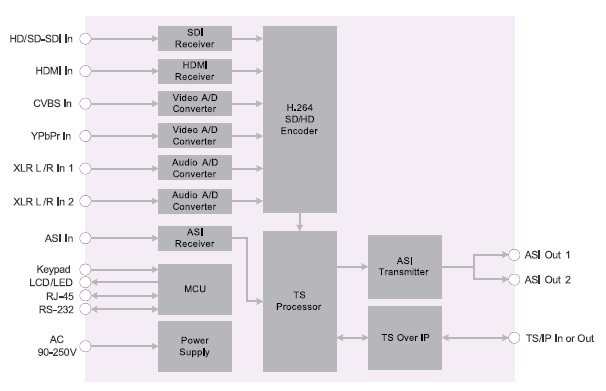 The compressed MPEG4/H.264 signal can then be sent to ASI and IP outputs. A built-in multiplexer allows the ADV-4100EC to combine streams between the encoder and outside ASI/IP sources, into a single MPTS. This is a unique feature that is not present in competing equipment. Click on “ADV-4100EC Datasheet” for technical specifications.